As a NASA spacecraft orbiting the small planet Mercury settles into an extended mission, the space agency announced that a set of twin moon gravity probes will also get some extra science duty. On March 17, the Messenger spacecraft began its second year of science operations at Mercury — a bonus that NASA granted last November. On Monday (March 19), agency officials announced an extension for the lunar gravity-mapping Grail mission, which was slated to wrap up in June after three months studying the moon. "It's about a 90-day mission, and then the extended mission will be another 90 days or so," Jim Green, head of NASA's planetary science division, said Monday (March 19) at the 43rd Lunar and Planetary Science Conference (LPSC) in The Woodlands, Texas. "Congratulations to the Grail team." 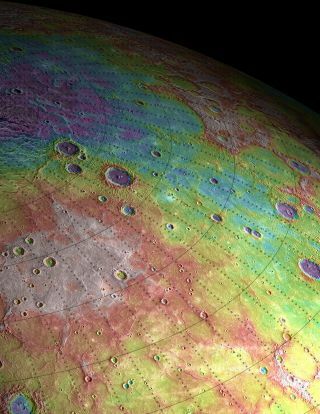 Messenger is mapping Mercury's surface and gathering data on the planet's composition, magnetic environment and tenuous atmosphere, among other features. To date, the spacecraft has taken nearly 100,000 photos and made more than 4 million measurements of the planet's surface, researchers said. "The first year of Messenger orbital observations has revealed many surprises," Messenger principal investigator Sean Solomon, of the Carnegie Institution of Washington, said in a statement. "From Mercury's extraordinarily dynamic magnetosphere and exosphere to the unexpectedly volatile-rich composition of its surface and interior, our inner planetary neighbor is now seen to be very different from what we imagined just a few years ago." Yesterday (March 21), for example, scientists using Messenger data announced that Mercury's iron core is surprisingly large, and likely overlain with a strange solid layer of iron and sulfur unknown on the solar system's other rocky planets. While Messenger studies Mercury, NASA's $496 million Grail probes (short for Gravity Recovery And Interior Laboratory) are hard at work at Earth's moon. The Grail mission launched in September 2011, sending twin spacecraft toward the moon to map lunar gravity in unprecedented detail. Each probe is about the size of a washing machine. The probes, known as Ebb and Flow, arrived around New Year's Day, then spent several months spiraling down to an orbit just 30 miles (50 kilometers) or so above the lunar surface. They began taking data on March 6. Ebb and Flow are chasing each other around the moon. Regional differences in the lunar gravity field cause the two spacecraft to speed up or slow down slightly, changing the distance between them as they fly. Bouncing microwave signals back and forth off each other, Ebb and Flow are gauging these tiny distance variations constantly. The Grail team will use the twin probes' measurements to construct detailed maps of the moon's gravitational field. These maps are expected to reveal a great deal about lunar composition, allowing scientists to draw insights about how the moon formed and how it has changed over time, researchers have said. Ebb and Flow are both also carrying cameras dedicated solely to education and outreach, as part of a project called MoonKam (Moon Knowledge Acquired by Middle school students). MoonKam gives schoolkids around the country the chance to choose areas on the lunar surface to photograph. NASA announced today (March 22) that the first student-requested Grail photos had been beamed back to Earth. The pictures, of the lunar far side, were chosen by 4th grade students from Emily Dickinson Elementary School in Bozeman, Mont. The kids received the honor by winning a nationwide naming contest for the Grail spacecraft, NASA officials said. Before the contest, the spacecraft were known simply as Grail-A and Grail-B.